Marie Osmond has stunned doll collectors and fans alike with her beautiful doll "Bella's Kewpie" celebrating the Kewpie doll's 100th anniversary. Sculpted by artist Sonja Bryer, this is a 12 inch seated porcelain doll with blue eyes . She is dressed in a colorful floral print dress with a coordinating sweater. A black headband with a large pink flower pulls her blonde wavy hair back from her beautiful hand painted face. Blue-gray tights with floral appliques, and pink mary jane shoes complete her sweet and stylish ensemble. 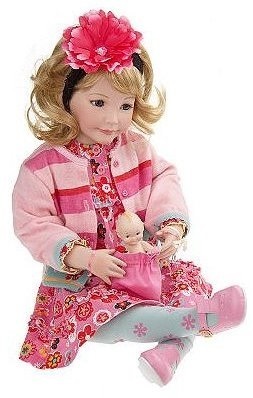 In her hands, she holds a small porcelain kewpie doll in a pink bag. "Bellas Kewpie" has a porcelain head, arms, and legs, and a cloth body. She has a Manufacturer's Certificate of Authenticity; hallmarked with Marie Osmond's facsimile signature on the back of the neck. Bellas Kewpie is a limited edition of 300, and is perfect for ages 14 and up.